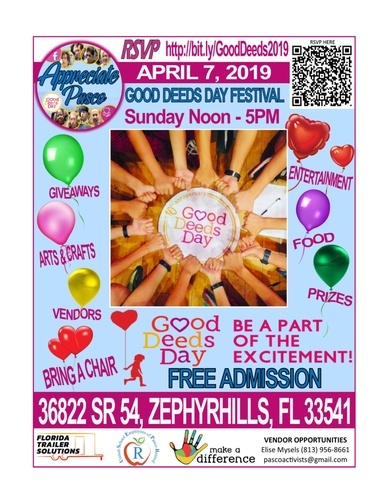 Zephyrhills, FL—On April 7, 2019, area residents, arts & crafts vendors, for profit businesses, non profits, local dignitaries, faith groups, healthcare practitioners, entertainers, public service participants, community volunteers and Pasco County students, will turn out to attend and participate in the second Annual Appreciate Pasco Festival. Good Deeds Day is a global day that unites people from 100 countries to do good deeds for the benefit of others and the planet. Since 2007, millions of people from thousands of organizations and businesses join together every year to volunteer and do good. Good Deeds Day is an annual tradition of good deeds. All over the world, hundreds of thousands choose to volunteer and help others, putting into practice the simple idea that every single person can do something good, be it large or small, to improve the lives of others and positively change the world. Good Deeds Day held its largest day yet on April 15, 2018. 3,500,000 participants from 100 countries took part in Good Deeds Day, totaling over 7 million hours of service. 68 entities participated in the first annual Appreciate Pasco Festival that day. Check out the photos on the Appreciate Pasco Facebook page. The Appreciate Pasco: Good Deeds Day Festival kicks off Volunteer Appreciation Week and offers an opportunity to recognize and thank groups and organizations, along with their volunteers, who lend their time, talent, voice and support to causes they care about in our community, and honor ALL volunteers who are working on behalf of others without being motivated by financial gain. WHO: Area residents, arts & crafts vendors, for profit businesses, non profits, local dignitaries, faith groups, healthcare practitioners, entertainers, public service participants, community volunteers and Pasco County students. WHAT: Appreciate Pasco – Good Deeds Day Festival. The event is designed to be family friendly and neighborly. It will provide entertainment, activities, arts & crafts, food, prizes, vendors, and giveaways.